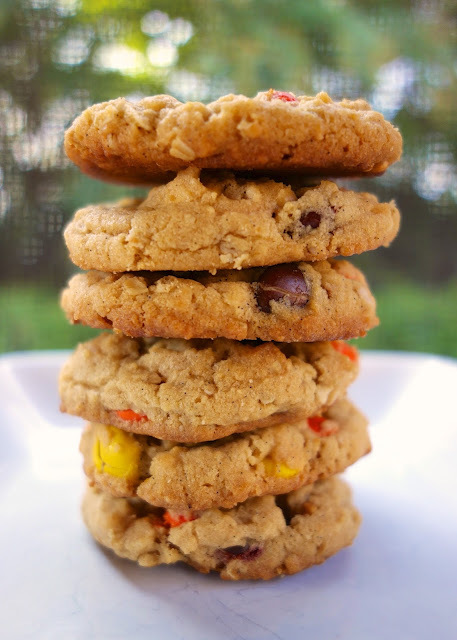 Reese's Pieces Peanut Butter Oatmeal Cookies - peanut butter lover's dream!!! Crispy on the outside and soft on the inside. PERFECT!! Flour, baking soda, salt, butter, peanut butter, sugar, brown sugar, vanilla, egg, oatmeal, Reese's pieces. Loads of peanut butter flavor with a hint of oatmeal. SO delicious! I always double the recipe because they don't last long in our house! Chicken Legs has been traveling more with his new job. I've been trying to be nice and have treat for him when he gets home. I've been craving a peanut butter oatmeal cookie for a while, so I decided to kill two birds with one stone. One word - delicious! These cookies are crazy good. Crispy on the outside and soft on the inside. I usually just eat one cookie, but I ate several of these before I could make myself stop. I loved the peanut butter and hint of oatmeal, but it was the Reese's Pieces that really made this cookie for me. Chicken Legs was in agreement. These cookies are delicious! Preheat oven to 350ºF. Line two baking sheets with parchment paper and set aside. Cream together the butter, peanut butter, granulated sugar, brown sugar and vanilla extract until lifht and fluffy, about 2 minutes. Add the egg and beat well. Gradually add the flour, baking soda and salt until just combined. Stir in the oats, and then the Reese's pieces. Bake for 10-12 minutes. Cookies will be golden brown the bottom and look underdone on top. 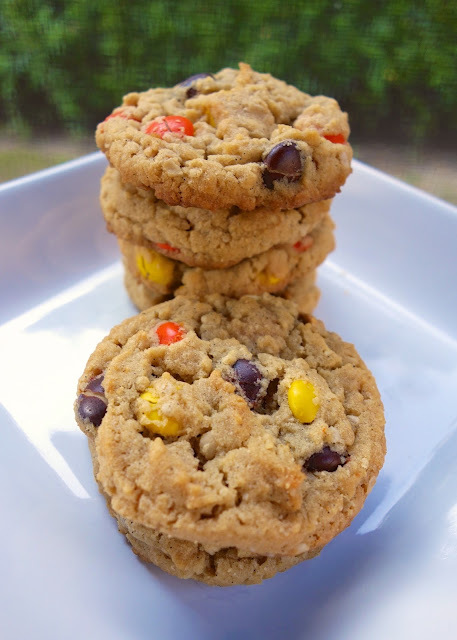 I love oatmeal cookies...and I love Reese's Pieces, therefore - I know I'd love these! Heather - you and me both! Enjoy! If you can find it, get Peanut Butter and Company white chocolate wonderful. It's PB with a hint of white chocolate. It's wonderful in baked goods. It just might change your life! I think these will be my next cookie. I use natural peanut butter with no sugar. Do I need to use something like Jiff for this recipe? Miss Pants - I always use something like Jiff or Skippy when I bake cookies. I don't have much experience with no sugar all natural peanut butter in baking. These sound fantastic!! LOVE a good PB cookie. And the traveling spouse. Ugh. I know your pain! I just made these with White Chocolate Wonderful. They are awesome! Really peanut buttery! Also, the small-ish, resealable bag of Reece's pieces is almost exactly a cup and a half! I made these yesterday just like your recipe and WOW WOW WOW they are SO easy to make and SOOO good!!! Thanks for the recipe! I made these today--snow day. Not only were they delicious but smelled wonderful and after shoveling snow were an amazing treat. Thanks for sharing.